Alyssa Heath 5’5 G Mohave High School, Bullhead City AZ- Alyssa Heath is a solid guard, who like her sister is fundamentally sound and plays hard every possession. Heath was solid handling the ball and defended well against players that were older and physically stronger, Heath rebounded when the opportunity presented itself and can shoot out to the three stripe. Heath will be a name we follow in the Bullhead are for the next four seasons. Janae Byrd 5’6 CG Verrrado High School, Buckeye AZ- Janae Byrd is an athletic combo guard with a solid skill set and above average athleticism. Byrd handles the ball well, rebounds and can shoot the ball out to the three stripe. Byrd is another player with a high ceiling and another in the Verrado High system. Ialesha Mike 5’0 PG McClintock High School, Tempe AZ- Ialesha Mike is a solid developing player who plays extremely hard on both ends of the court and has fun while doing it. Ialesha Mike like other smaller guards in the showcase was scrappy and didn’t back from tougher stronger competition. Ialesha is just a freshman and if she continues to play with the passion she displayed, she will have a bright future. Maricela Garcia 5’4 PG Pueblo High School- Maricela Garcia is like several of the other Pueblo High players in the fact that she is a tough competitor with a solid skill set and feel for the game. Garcia handles the ball well and possesses a nice mid range jumpsuit. Maricela Garcia is another Pueblo High player to keep and eye on this season. 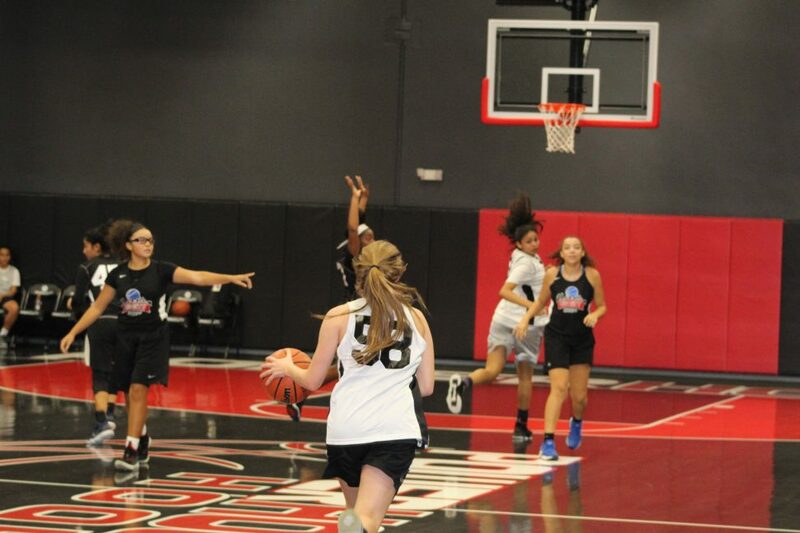 Sienna Cherwinski 5’5 PG Verrado Middle School- Sienna Cherwinski turned heads at the showcase with her solid play, ball handling, defense and scoring ability. Cherwinski is confident in her abilities and it shows on the court, especially when she went up against several older skilled players, where she didn’t back down. We Cherwinski can kibe a special player if she continues to develop. Mia Amundsen 5’3 PG Western Sky Middle School, Goodyear AZ- Mia Amundsen is a solid player with a good feel for the game and a high basketball IQ. Amundsen is a gamer who has the toughness and mental preparation to compete with players two to three grades above her own. Amundsen is another player in the strong 2023, 2024 class in AZ. Micaela Chavers 5’6 CG Verrado Middle School, Buckeye AZ- Micaela Chavers is another skilled Verrado Middle School kid that can play and has a high basketball ceiling. Chavers is extremely athletic and can run the floor with the best of them. Chavers handles the ball well, has good court vision and can score. Chavers will be a name to remember in Arizona. Mirella Funari 5’5 G Western Sky Middle School, Goodyear AZ- Mirella Funari is fundamentally solid player who can handle the ball, pass rebound and shoot. Funari has a good feel for the game and plays with confidence. Another player in this class with a high ceiling. Cynthia Lopez 5’3 Western Sky Middle School, Goodyear AZ- Lopez is fundamentally sound, hard working player with a solid skill set and basketball IQ. Lopez competed well and played with confidence. solid handles, passing and jumpshot. Wrenwyck Ijkiwoje 5’5 PG Akimel A-al Middle, Phoenix AZ- Wrenwyck Ijiwoje plays at a level older than the class of 2023, Ijiwoje has all the tools to be a household name in the state of Arizona. Ijiwoje can pass, shoot and score with efficiency and her defense and scoring ability are huge. Ijiwoje is once again another player in the Verrado stable. Mia Davis 6’0 CG Legacy Traditional School, Phoenix AZ- Davis arguably is at the top of the class of 2023 as her size, ball handling and scoring ability are off the charts. Davis is a competitor who plays hard on both ends of the floor and does not back down from any of the competition. Davis may still be growing and will be a household before its over. Aaliyah Garcia 5’3 Centennial Middle School, Phoenix AZ– Aaliyah Garcia was a showcase surprise as she was a last minute walk up, but quickly got noticed due to her hard tough play and her ball handling and scoring ability while standing only 5’3. Garcia is a competitor who loves the game and will continue to improve. Bella Barrett 5’10 Verrado Middle School, Buckeye AZ- Bella Barrett is a solid player who does everything the right way, Barrett has good size and skill set and will continue to improve and grow, Barrett, plays hard and competes, keep an eye out for Barrett in the future. Olivia Arvallo 5’2 G Verrado Middle School, Buckeye AZ- Olivia Arvallo is a competitior and another player who showed a toughness and the willingness to compete at a high level. Arvallo has a solid skill set and will only improve over time. Gabriella Erbst 5’5 G Hollinger Middle School, Tucson AZ- Gabriella Erbst is another tough Tucson kid who plays hard and is fundamentally sound. Erbst shoots it well and defends with intensity . Erbst has a nice shot and can handle the ball above average, we will keep and eye on Erbst in the future. Lexi Erbst 5’0 Bollinger Middle School, Tucson AZ- Lexi Erbst like her sister Gabriella is a tough hard nosed competitor who plays hard and defends with intensity. Erbst is not afraid to take shots and penetrate and kick at the basket. Erbst like her sister have a bright future in Arizona hoops. Amelia Cartegena 5’4 PG Kyrene Middle School, Tempe AZ– Amelia Cartegena is a solid PG who plays with intensity and competes on ever play. Cartegena has nice handles for her age group and can shoot and pass in transition. Cartegena was attentive and eager to learn and compete with the best. Cartegena has a bright future ahead of her. Ashian Hunter 5’2 PG Taylor Middle School, Mesa AZ- Ashian Hunter is a player a coach would want to coach, Hunter came to the showcase ready to compete and showed that she is a competitor. Hunter has a nice skill set for her age and will only get better. Hunter held her own against players two levels above hers and competed. Hunter handles the ball well, shoots with some consistency and plays hard. We will keep an eye out on Hunter the next couple of seasons. Hannah Fuentes 5’2 PG Dexter Middle School, Whittier CA- Hanna Fuentes traveled all the way to Phoenix from Whittier California to compete and show her skill set. Hannah Fuentes is small in stature but make no mistake the kid competes. Fuentes has a nice fundamentally sound skill set for her age and does a number of things well for a young PG, such as court vision, shooting and passing. we will check in on Fuentes’s progress in the future. Monica Menzies 5’4 PG Dexter Middle School, Whittier CA- Menzies like Fuentes traveled from Whittier California to compete in the showcase, Menzies performed well and was eager to learn and compete with the best. Menzies is solid and makes good decisions with the basketball in hand. Menzies shoots well and sees the court. Like Fuentes, we will check in on her progress in the future. Camisha Fuson 5’1 PG Rhodes Middle School, Mesa Arizona- Camisha Fuson is a competitor and despite her size, has the skill set and desire to be a special player in the California area if she continues to progress. Fuson has nice handles and can shoot the ball very well when left open. Fuson defends well and see the floor and makes good decisions with the basketball in transition. Like many players her age, Fuson needs to get stronger and she progresses. Amelie Buffill-Gutierrez 5’3 PG Basic North, Tucson AZ- Amelie Buffill-Guttierez is a solid young player who came to compete and played hard on both ends of the floor. Gutierrez can handle the ball well for her age and can defend and score when need be, Gutierrez clearly has the passion and drive for the game and as the evening wore on it showed. Guttierrez will continue to improve and we look forward to seeing her compete in the very near future. Victoria Cazares 5’6 Hollinger Middle School, Tucson AZ- Victoria Cazares is a solid player who is coachable and plays hard on both ends of the court and doesn’t take plays off. Cazares can handle the ball and can penetrate and kick if the defender takes a play off. Cazares can shoot the ball well out to the three stripe and has a nice mid range jumper. Cazares is one to watch in the near future in Tucson hoops.